On illumina sequencing platforms the loss of base call accuracy is gradual and related to the number of sequencing cycles performed. Sometimes however you will see a sudden and lasting loss of sequence quality across all clusters. This effect is reported by the sequencer itself and is evident in the distribution of phred scores reported against the base calls being produced. Depending on the exact cause it may also be apparent in some of the other internal metrics and plots available within the illumina sequencing software. This type of failure is easily spotted with the FastQC per base quality plot. 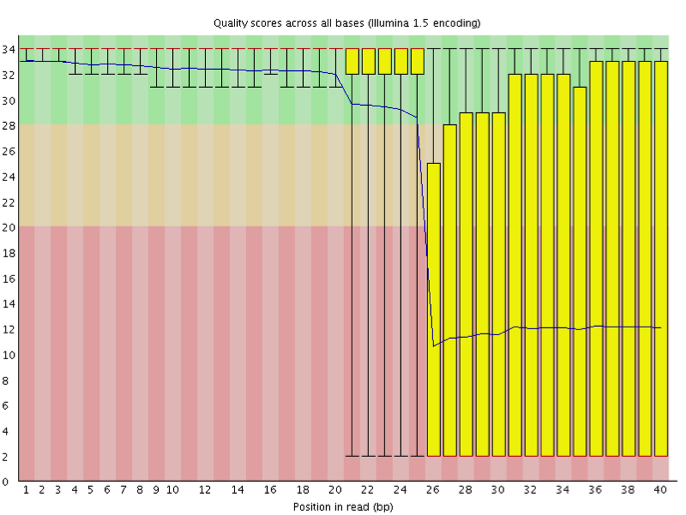 Additional useful information may be available from the internal illumina per base signal strength plots. This type of failure is usually indicative of a technical failure with the sequencer itself. Sometimes this can be a true component failure in the illumination or imaging systems, but it can be something as simple as a leak in the fluidics system which obscures the surface of the flowcell (liquid leaking from the gaskets for example). Something similar could also be caused by exhaustion of the sequencing reagents. There is no mitigation for this data, and the poor quality bases will not be able to be recovered. If the run has progressed to a sufficient extent then quality trimming should remove the affected bases and you could continue with the analysis of the initial, good quality, bases.